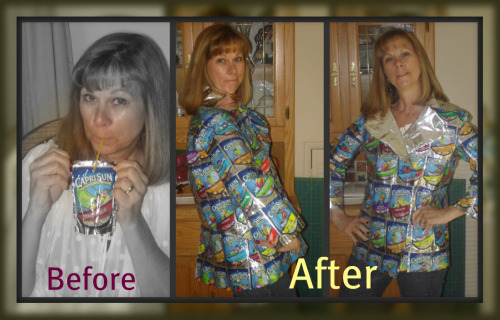 If you're a complete Capri Sun fiend and just hate wasting all those left over packets, this jacket design might be just what you needed. It only takes 140 pouches. Wow. Waterproof, UV resistant, coated mylar. I would have left the inside facing out, but still pretty dang awesome. Absolutely loved the strawberry, orange, and apple flavoured drinks. You know why they put this stuff in pouches? Pour it out into a glass and look at it. It looks like the ammonia water my grandmother used to soak her combs in. Made me a tote bag out of them. Sold tote bag for thirty bucks. "What To Do With Capri Sun Packaging"